A merchant sailor from Marseilles, Dantes, through the treachery and false accusations of three men, is imprisoned for 13 years in the notorious Chateau D’If on an island in the Bay (if you go to Marseilles you can still sail past it.) Near to despair, he’s befriend by a “Mad Priest” who clues him in to the ways of the world and, before dying, reveals the location of treasure buried on the Island of Monte Cristo. A particularly effective moment in this production is the projected video, scratched and wavering as if in the winds of memory, that shows Dantes’ escape: he crawls into the dead priest’s burial sack and the guards throw the “corpse” into the sea. He survives against great odds, eventually gets his hands on the treasure, and having purchased the island plus the title, the man tossed for dead is reborn: he is now the Count of Monte Cristo. Aristocrats, it turns out, are no different from anybody else. With enough money, you can be a Count. It’s a revolutionary idea in this novel set shortly after the French Revolution, and gives the story heft beyond even its hallmark theme of personal revenge. Behind the noble and wealthy identity is the man who will never forget, as this production reminds us with its set on which his counted days of prison are forever charcoaled on the walls. Returning to Marseilles, he learns that his fiancée, Mercedes is now the wife of one of the men who conspired to send him to prison. After one good deed for a friend, he turns to revenge on his enemies. Always he works secretly and, part of the fascination of this production is the way he takes his time, outwardly social, inwardly stealthy, certain of his goals. He always wears white gloves – of a gentleman? Or a criminal? His large gloved hands look ready to strangle somebody. The Count navigates his way through a swirl of intrigues, infidelities, opportunism, love, hate, all manner of disloyalty and a buried child, always with his eye on destroying his enemies who, not knowing his true identity, see this new aristocrat in town for what he can do for them. A victim of injustice, he works to set things right — in his own terms. The characters don’t leave the stage but remain, now central, now sidelined, as in life, but always there, as in memory. I’ve seen this device used elsewhere, but never better. His quest takes him to Paris where his three targets are living, and the cast of characters – in complications of intrigue – multiply. He dazzles everybody and eventually manages to destroy his three enemies by manipulating them to self-destruct – how I won’t say but it’s at one heck of a party! The acting of this young cast roams between competent to excellent. Tom Frank brings authority to the role of Monte Cristo that helps to hold the many parts of this complex play together. C. Walker, Jr. is a passionate, expressive Mondego. Amanda Berry performs a sweet though tame belly dance (in the role of the wronged Pasha’s daughter who loves the Count – there really is a lot happening in this play!). The dance made me realize that the play could use some songs. The movement of this large cast in and around the stage is various, ranging through monolog, naturalistic confrontations, bombastic proclamations, framed by evocative original music by Henry Aronson and a simple but handsome circling of the cast, suggesting the ritualistic insistence of memory. A graceful yet truly vicious duel scene directed by Dan Renkin is a high point. I take Monte Cristo to be a work in progress – it has rough edges, the story could be told with even greater clarity, the cast could be more seasoned but it’s already an achievement with a clear creative vision. What mind filling theatrical abundance! 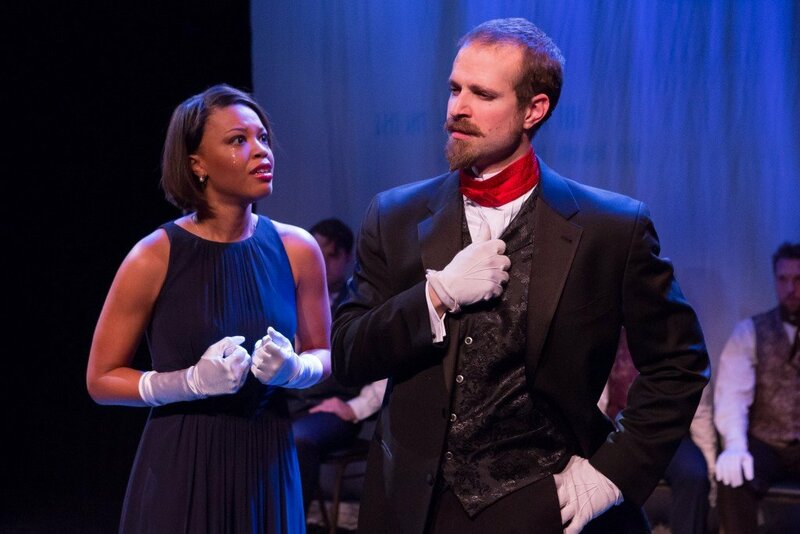 Monte Cristo a New Light Theater Project, plays at Urban Stages in Manhattan’s Chelsea district through February 13, 2016. For more information and tickets, click here. The Count of Monte Christo is indeed a complex novel with quite a bit going on. This production goes quite far in telling the story using the main themes of deception, revenge, and to some extent redemption. 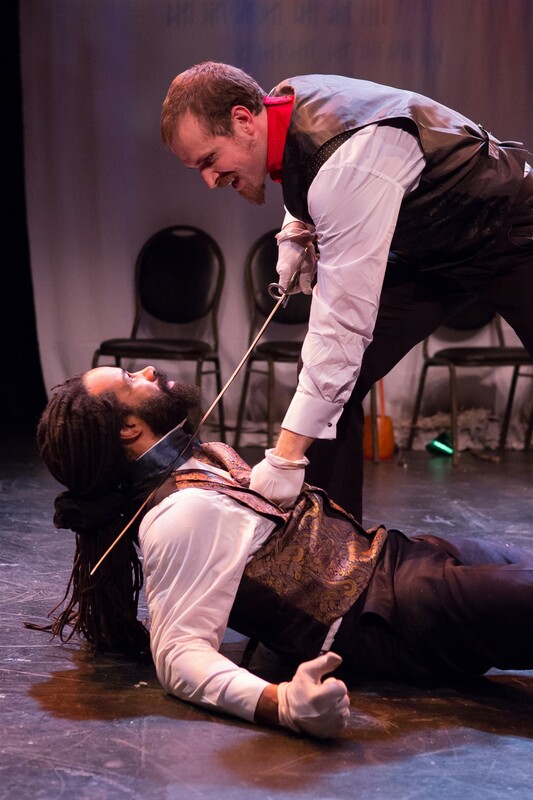 I agree one of the high points was the swordplay near the end of the play. As one thinks about the splendid production, could it not be made into an opera? I too recommend it to go see – a rare treat and saves you from having to read a novel.